In their newest collaboration, Jaclyn and co-author Glenn W. Muschert provide a critical retrospective of the 1999 Columbine High School shootings as the 20th anniversary approaches. Columbine was a watershed event that changed the way America views mass shootings, both in and out of schools. In this book, the authors will consider Columbine’s impact on public opinion about mass shootings, school security, law enforcement practices, threat assessment, legislation, and more. In addition to considering the changes made in the past 20 years since the shooting, the authors also offer consideration of how the nation continues to move forward as we surpass this milestone anniversary. All royalties from this project will be donated to the Columbine Memorial Foundation. Visit their website at http://www.columbinememorial.org/ to learn more about this organization or to contribute to maintaining this memorial site. 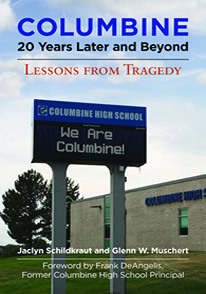 “Jaclyn Schildkraut and Glenn Muschert have done a magnificent job in documenting the lessons we have learned from Columbine over the past 20 years. Even the most knowledgeable persons will learn from this masterful work. Columbine, 20 Years Later and Beyond fills a glaring gap in our knowledge about the shootings and their effects on the Columbine community and America. Although scholarly and fact-based, the book reveals the authors’ sensitivity and compassion for all those affected by the event. It is a must read for anyone who is seriously interested in the Columbine shootings and their subsequent impact on American society.